Please note: It will be helpful to obtain a copy of the Vincent Bach Mouthpiece Manual for reference before reading this article. It is freely available online from here, or a quick google search for “Bach Mouthpiece Manual pdf”. A discussion by Richard Colquhoun about Vincent Bach Trumpet Mouthpieces. The subject of trumpet mouthpieces can often be seen as an endless mind-field. There are a lot of brands and types. Many are vastly different and designed for specific purposes (although individuals may use them for other purposes). 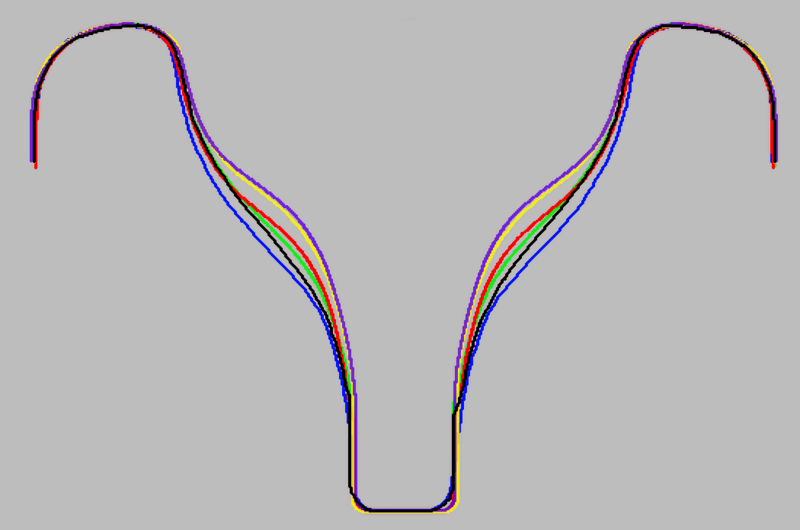 Many are similar, generic copies or variants of the same designs made and manufactured for making profit and not for facilitating a developing trumpet player. Until now I have resisted the urge to offer my opinion about mouthpieces on this blog. That is in part due to the fact that although the number of mouthpieces I frequently use is decreasing it is always in a state of flux, and that may not ever change. This article is intended to address factual information that is often missed or over looked in reference to one particular brand of mouthpiece, I will also present further information based upon my experience and research with the hope that people can make better-informed choices about mouthpiece selection. I will begin by addressing information that is provided in the mouthpiece manual. 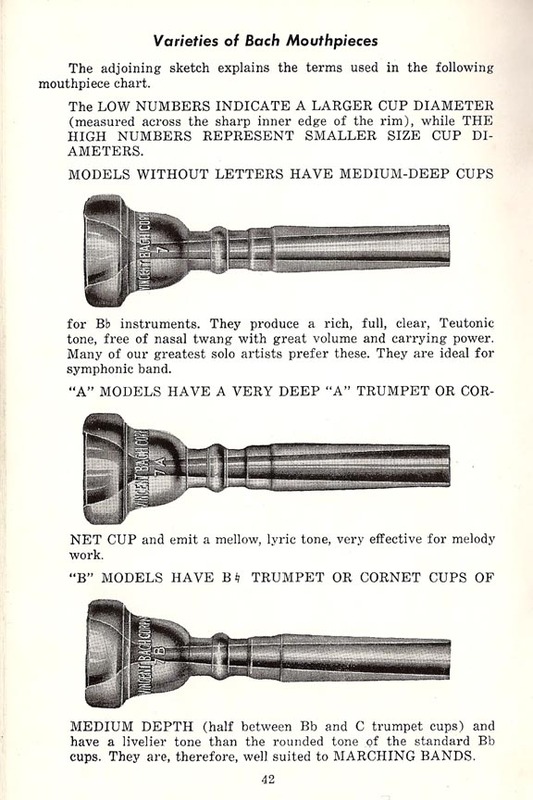 This section may be most useful for those in search of information regarding Bach mouthpieces; be sure to at least read the sections about internal diameter and cup shape. I will also address some well known inconsistencies that the comparison chart does not mention, changes to the manual over the years, and I will discuss how Vincent Bach’s designs and opinions may have influenced the path of brass playing during the last century. Vincent Bach is one of the most celebrated brass instrument designers and builders of the twentieth century. His Stradivarius trumpets are a standard of quality in the industry favoured by many of the world’s professional and amateur brass players. An achievement of at least equal importance, though, is his contribution to the design of mouthpieces. The first notable influence that Vincent Bach had was his system for describing the various shapes and sizes of mouthpieces. All major brass mouthpiece manufacturers to this day use a derivative or similar system to describe their products. As I address each part of this system I will explain how it works and then mention interesting things about it that are often overlooked. The internal diameter of the mouthpiece is described with a number. 1 is the largest and 20 is the smallest. For most numbers there are a few half-sizes and even some quarter sizes. Some numbers (4 & 13-16) are missed out. I don’t know the exact reason for this; one could speculate that initially there were spaces left for sizes that were never designed, but that is pure speculation. When looking at the various sizes of mouthpiece internal diameter it is most people’s habit to consider the 7C as the smallest option and look upwards in the chart from there. The reason for this is at least twofold. 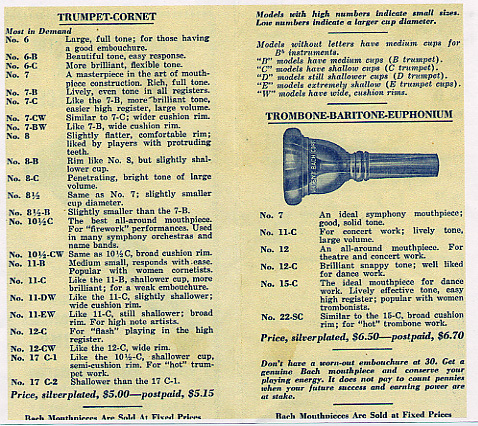 Firstly, most new trumpets are supplied with a mouthpiece labelled 7C. When people move on from their 7C wanting a better sound they assume that this requires getting a mouthpiece with a larger internal diameter and look upwards on the chart (For reasons that you’ll discover later, this is usually a mis-informed choice). A possible second reason is one of tradition, though it may be better described as mythology or even superstition. Because of the playing habits of a few big names in orchestral playing (Adolph Herseth, Georges Mager, William Vacchiano), trumpet players have unneccesarily copied their choice of equipment in the hope of recreating their achivements. The mouthpiece manual actually advises against this: “Do not select a certain mouthpiece because another player uses it. […] what is perfect for one may be entirely unsuitable for the other” (page 3). So here’s the important observation about internal diameters that nearly always gets overlooked when people talk about the various Vincent Bach mouthpieces. The size of a 1 is listed as 17.50mm. The various other 1 sizes, including 1-1/4 and 1-1/2, are listed as 17.00mm. A difference of 0.5mm. This pattern continues; the 2 and 2C both have 16.50mm internal diameters. So which mouthpiece do you suppose would have an internal diameter of 16.00mm? Maybe a 3? No, the answer is 10. What? 10? The difference between a 1C and a 2C, with nothing in between is the same as the difference between a 2C and a 10C with six different sizes in between. Fact. Here’s another thing: sizes 6, 7 and 8 are all listed as having the same rim size. Actually a 5 is apparently only 0.05mm different – that’s approximately the width of a piece of paper. When you consider that your lips will swell more than that whilst you’re playing, just because of extra blood flow, it makes the difference completely insignificant. A sharp rim will not cut the lip if the flat face of the mouthpiece rim is placed on the lips in (or slightly above) a horizontal position, with the mouthpiece at a 90 degree angle against the front teeth. A sharp inner edge against the lip will automatically remind the player that the instrument is not being held correctly. The use of a mouthpiece without a sharp inner edge is not recommended, as it would not allow sufficient surface to distribute pressure over the lips. In his mouthpiece guide, Pops McLaughlin speculates that Vincent Bach most-likely intended his 1 mouthpiece for specific but rare occasions – because it is huge. There is a lot of variation in the various rim shapes with Vincent Bach mouthpieces and despite his advise there were quite a few available with much less bite. Interestingly, I’ve talked with very few people (including teachers and professional players) who realise that there are more mouthpieces on this chart that are smaller than a 7C than bigger. I think this speaks volumes about people’s buying habits in the past verses today, and brings into question the reasons behind it as well. I advise that when you are choosing a rim size from this range of mouthpieces to choose either small, medium or large, and then go to a supplier and try the various rims shapes in that size range. Feel safe in the knowledge that the variations in tonal colour within any range of mouthpieces will be affected more by the cup shape than the difference in internal diameter. Cup depths are notated with letters. “A” cups are the deepest; standard cups have no letter designation; progressively shallower cups are marked B through F.
There are other cup shapes available, but not across the whole range of diameters. There are also quite a few that come with a wider rim (marked W, e.g. 7EW) but these have the same cup shapes as their non-wide counterparts. 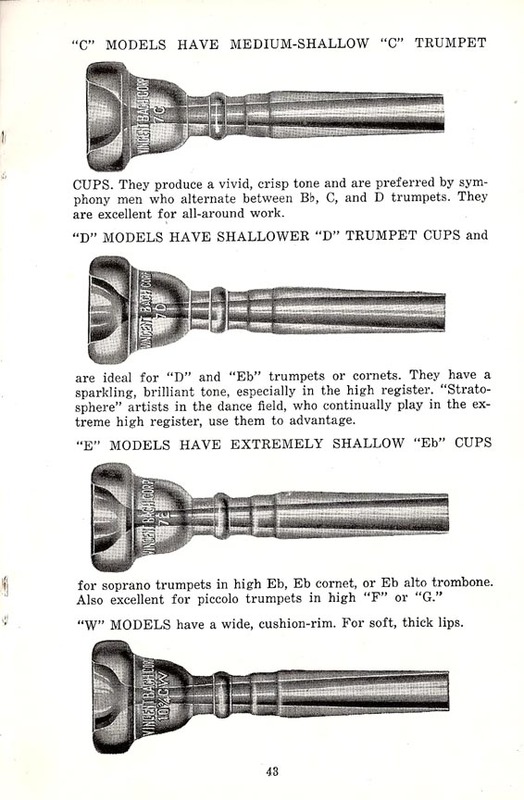 The mouthpiece manual states that a player should match the pitch of the instrument being played with the cup depth of the mouthpiece. A player using a medium-large bore B♭ or C trumpet or a B♭ cornet should generally use a mouthpiece no shallower than the Bach C cup and preferably, slightly deeper cups such as a B or A. One exception is for musicians who continually play in the extreme high register and desire a brighter sound. In my opinion these statements show how the tonal concept of the trumpet has changed in the last 60 or so years. The deeper cup on a Standard or A-cup mouthpiece would produce a far more mellow, smoother, cornet-like tone. That sound would less-likely project well and it is unlikely that a player spending much time in the high register would be particularly comfortable (as suggested in the quote above). These ideals have changed over time, probably as a result of the increase of demands that have been put on trumpet players in more recent times in terms of range, dynamic and particularly stamina. What else is there to know about cup shapes? Well the depth of your mouthpiece cup directly relates to the amount of feedback the player senses with their lips whilst playing. If you double the depth of the cup on your mouthpiece then you feel less than half of the feedback, causing you to work much harder. Basically you work harder for the same result. Shallower mouthpieces are much more efficient than deeper ones because the air is compressed much sooner as it enters the throat – this means that you can play the same thing with less effort. But really the tone/projection/stamina you need depends on the style of music you are playing and is purely subjective. Do you need to blend with others or cut across a loud amplified band? These are probably not things that the average player needed to consider as now when Vincent Bach first designed his mouthpieces. When looking at various B-cupped mouthpieces on the Kanstul Comparator one can see that the only thing that is really changing, even between two extremes such as a 1B and a 10B, is the diameter at the top. All B-cups meet in shape by approximately half-way down the concave part of the cup and the rest is exactly the same. This is not true of the C-cups at all. The Wedge Mouthpiece Blog explains the argument “not C cups are not created equal” in this blog post, which discusses the common but not-so-intelligent mouthpiece size progression that many teachers follow. With a briefer follow-up post here. 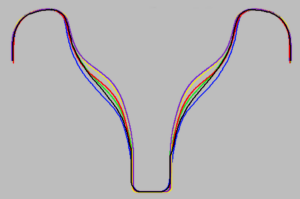 These articles show and discuss that the 3C has a shallower cup and the 7C has a deeper cup when they are compared proportionally to other C-cupped mouthpieces. This means that switching between a 5C and a 3C is a bigger change than between a 5B and a 3B. This inconsistency in design is quite baffling really and it isn’t helpful for someone wishing to make an informed choice about a change of mouthpiece. Another way that Vincent Bach mouthpieces are known to be inconsistent is much more general. The previously mentioned inconsistencies were by design, but it is actually well known that over the course of time there were wild inconsistencies in general production. In the interest of avoiding libel I will state now that most of what I write here is hearsay, gleamed from years of trawling through the Trumpet Herald forum and having conversations with other trumpet players. It is said that mouthpieces made in the Mount Vernon factory (between 1953–1964) are noticeably smaller than their modern equivalents. Many players favour these older mouthpieces saying that they produce a more desirable tone. This could actually be a result of imperfections, the sort of vibrational chaos that Jason Harrelson talks about in his description of how a trumpet sound is produced. Famous players known to still use older Mount Vernon mouthpieces include Chris Botti and Arturo Sandoval. Mark Curry of Curry Mouthpieces describes such imperfections nicely in this forum post from 2011. He also suggests that some mouthpieces may be larger than intended simply because they were polished too much! This is an obvious negative side-effect of mass-production. In 1924 Vincent Bach began making revolutionary mouthpieces too. These had much wider rims that were more rounded in the lip contact area and with deep but rounded “C” shaped cups that were brilliant and cutting but not harsh! […] most young band players (like today) wanted to be heard above their band and the “C” shaped cornet mouthpieces made the kid’s cornet almost as dominant as if he’d bought one of those newfangled […] trumpets. By the 1960’s […] virtually all cornet mouthpieces sold in America were basically trumpet mouthpiece tops on shorter cornet shanks. Plus, some companies made cornets and trumpets that were basically the same instrument except in the leadpipe area where one would be made for a cornet mouthpiece and the other for trumpet. This is an argument that is posed in a post on The Trumpet Blog titled “Why did the cornet become a second rate citizen?“. Alongside this however, I believe that it’s not so much the demise in popularity of the cornet that should be mourned so much as the use of deeper mouthpieces on a trumpet. Whilst I realise that big band and commercial music cannot and should not be attempted on deeper mouthpieces there is a place in the musical soundscape for trumpet players with a rich lyrical sound. Indeed Miles Davis is known for having used a deep V-shaped mouthpiece for his whole career. The popularity of C-cupped mouthpieces has meant that when players wish for a “darker” or “broader” sound they tend to buy a mouthpiece with a larger internal diameter rather than a deeper cup. It is commonly overlooked that a mouthpiece is a three-dimensional shape and that the internal volume of a mouthpiece will be affected more by a deeper cup than a wider diameter. Professional musicians prefer the musical results of large mouthpieces, such as the Bach 1B, 1C, 11⁄4C, 11⁄2B, 11⁄2C, 21⁄2C, 3C, which provide a maximum volume of tone with the least amount of effort. By opening up the lips so that they do not touch, the larger mouthpiece produces a clearer, purer tone. I am curious when this statement was written, by whom, and where they obtained their information. In this image (right), which is a scan from the 1938 manual, it clearly states that the most popular models were in the medium to small sized range. In fact it says that the 10-1/2C is “Used in many symphony orchestras”. I am inclined to believe that the statement in the newer manual was written only to perpetuate the large mouthpiece mythology. It is clear when one examines the artist-endorsed mouthpieces from the present and past, that very few of the world’s best trumpet players from the last 70 years favoured mouthpieces with a large internal diameter. Another issue mentioned by Tom Turner, that I believe to be of utmost importance is that the rim shape of a Vincent Bach mouthpiece was far preferable than those generally available previously. The result of this is that a player could play for longer with poor technique. Use of excess pressure, a crooked embouchure, or an incorrect horn angle were now much less of a problem than before. Whilst this move was inevitable with the improvement in instrument design, and not the fault of Vincent Bach, it meant that a player would not be able to feel as easily when they are relying on a brute force approach to playing and longer term may never develop good playing technique. It is my contention that this, combined with the large mouthpiece mythology, are primary causes for so many struggling brass players today. Players overblowing and using too much lip pressure as a result of their large, comfortable mouthpieces is a direct cause of their inability to develop an easy upper register. In his mouthpiece guide, Pops McLaughlin points out that nobody has ever been offered a gig because their mouthpiece felt good! It appears that in solving one problem, another may have inadvertently been caused in its place. Finally, to address the whole quote, I have never read from or heard of a trumpet method (including the works of Herbert Clarke, J.B. Arban, Claude Gordon, Louis Maggio, Carmine Caruso, James Stamp, Bill Adams, Roger Ingram, Lynn Nicholson, Jerome Callet, Jeff Smiley, among others… I’ve read a lot of trumpet books!) that a player should be aiming to open the lips so that they do not touch. That statement is categorically incorrect. Hopefully by reading this discussion you now have enough information to make informed decisions about buying a Vincent Bach trumpet mouthpiece. There are many many more mouthpiece manufacturers in the world today and so you may also benefit from researching Schilke, Curry, Stork, GR or Marcinkiewicz, just to name a very few. However, the most important thing is that you now have a point of reference for comparing other brands and their design ideologies. Some well known makers, for example Monette, produce most of their designs based upon custom designs for famous players and it may be much more difficult to find a mouthpiece that suits you from them. Vincent Bach as a company owes much of its popularity to the fact that their products were some of the few to be universally available worldwide for quite some time. Using logic and common sense can lead anyone to conclude that under such circumstances “The Bach Sound” has become a universal standard to some because they don’t know anything else. There are both pros and cons to buying a Vincent Bach mouthpiece, some of which have been mentioned already. But maybe the most important thing to take into account is that technology, understanding and innovation has moved forward quite significantly in the last fifty years. Do you want to be using a modern trumpet with an old design of mouthpiece? Or would your vintage instrument be significantly improved by a modern mouthpiece? Best of luck making a decision, I don’t know if I ever will. I have recently started a Patreon account in order to take donations for my writing. You will only see this message at the bottom of posts that have taken me considerable time to research and write. If you have enjoyed reading this post or feel that you have learned from it then please consider using my tip-jar by following this link. Great article Richard. That must have taken some considerable time and research to produce that! Thanks for taking the time to read it all! This is one of the types of articles that I stewed over for some time and then blurted out in about 2 days. I surprised myself how many different references I got in there, but I wanted to make sure that it wasn’t just made of my own opinions! So comprehensive! Thanks for the great info. Thanks for a very interesting write-up on Bach mouthpieces. I would just like to politely disagree with your contention that Monette mouthpieces may present a difficulty in finding a suitable size. The fact that Monette does custom mouthpiece work for well-known players in no way means that they do not have a wide variety of standard sizes that can suit any player. Hi, Thanks for your comment. As it’s a while since I wrote this I had to look back an see what I’d said about Monette – I didn’t remember mentioning them at all! My comment actually strikes me as a little ironic as a lot of Bach mouthpieces were developed for individuals as well, though it’s been up here long enough that I’m not going to edit it out now. As years go by I tend to leave articles intact so that I can look back at how my opinions have changed. I still wouldn’t recommend Monette equipment, but that’s for ideological reasons that I wouldn’t put into a post intended for general consumption without a more comprehensive explanation. I’ve written another post about mouthpieces more recently that you may find interesting, but so far as I can recall there’s no mention of Monette in it. I have a Conn 80a (Victor) cornet made in 1952, I have tried a Bach 7c on it,but find it works much better on a 7b although the sound is a little on the dark side. I also find it easier to ascend on the 7b; I will just have to work on getting more brilliance I guess. Thanks for your interesting article. You’re welcome! Have you seen the article I wrote explaining my opinion of the difference between trumpets and cornets? It may help as the 7C is definitely a design intended for trumpet. The deeper cup and hence lower resistance of the B-cup if probably a better match for the conical bore of a cornet too. Best wishes.